That song has never been more true than it is right now! We are 10 days out from leaving for London. It’s also a happy coincidence that the band who sang that song is named Europe. For the most part we all seem very ready for the trip. There really isn’t any last minute scrambling around, which is nice. We did have a little snafu with one student’s Royal Palace Membership, which gets them entrance into 6 of the Palaces that we will be visiting, but we should be good to go and have her membership before we leave (hopefully). We had a very lively discussion Tuesday with our travelers. They each got to pick a book on London and did an informal presentation about the book to the group. It was very interesting to see some of the books that were chosen. We have one more meeting with the travelers before we leave, which we’ll mainly go over packing and last minute questions, and then we will be on our way. I have to admit I am starting to get excited now! First off I want to start by thanking everyone who has decided to take the time to read this blog. This is a first for me, so please excuse how rough the first couple posts will probably be. This blog has been started at a very busy time! We are only 20 days from the 2016 Wyatt Exploration Program to London. The last couple of weeks have been a whirl wind of planning and making last minute arrangements. 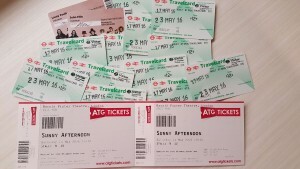 These memberships, ground transpiration, and tickets to Sunny Afternoon are just a few of the things that we have been purchasing ahead of time for our trip to London. Don’t worry I will keep you up dated on the happenings of the next 20 days as we slowly count down!